The thought of G. W. F. Hegel (1770 -1831) has had a deep and lasting influence on a wide range of philosophical, political, religious, aesthetic, cultural and scientific movements. But, despite the far-reaching importance of Hegel's thought, there is often a great deal of confusion about what he actually said or believed. 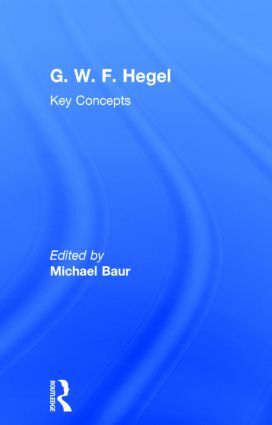 The breadth and depth of G. W. F. Hegel: Key Concepts makes it an invaluable introduction for philosophical beginners and a useful reference source for more advanced scholars and researchers. Michael Baur is Associate Professor of Philosophy at Fordham University, USA. His main areas of research include German idealism, the philosophy of law, American pragmatism, and contemporary continental thought.